£8 worth of essential sports nutrition gear for just £4! High 5 Zero is a light, refreshing fruity sports drink with no calories - it's all about hydration. Quite simply, dehydration isn't just a lack of fluids; it's a lack of electrolytes too. Zero means you can keep yourself topped up with vital electrolytes before, during and after exercise, whatever your activity - football, rugby, biking, martial arts, motor racing, running, triathlon, swimming, hiking, aerobics, racquet sports, etc. If you're expending energy, you'll need to hydrate! Working in hot environments - such as you'd find in the mining and oil industries, firefighting and the military it can be worth keeping an eye on your hydration and electrolytes too; Zero has applications beyond those of the sporting world. The easy dissolving, easy-break tablets are designed to be snapped in half so you can determine your ideal drink strength. To carry your hydration with you, you'll need a bottle! The High 5 Run Bottle (330ml) is moulded with a handle shape for ease of carrying while you run, and is fitted with a fast-flow pull valve for effortless drinking but zero spillage of your Zero! Hydration is one thing, energy is another. Food gives us energy, but it needs breaking down and digesting: you can't munch through a bag of chips while you're running a marathon or hunkering down over the bars and expect a burst of instant energy! 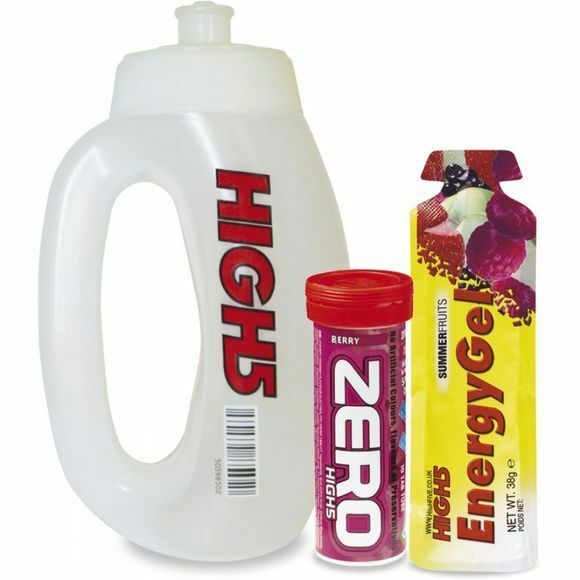 Energy Gel from High 5, race proven in the World's toughest events, is light to carry, easy to open and swallow, has a light and refreshing taste and, all importantly, effectively delivers carbohydrates to your body to keep the energy pumping.